LTHForum.com - Airplane Food...Yuck! I mean...Yummers? LTH Home > Chat > Other Culinary Chat > Airplane Food...Yuck! I mean...Yummers? Ummmmm.... And what was this SUPPOSED to be??? 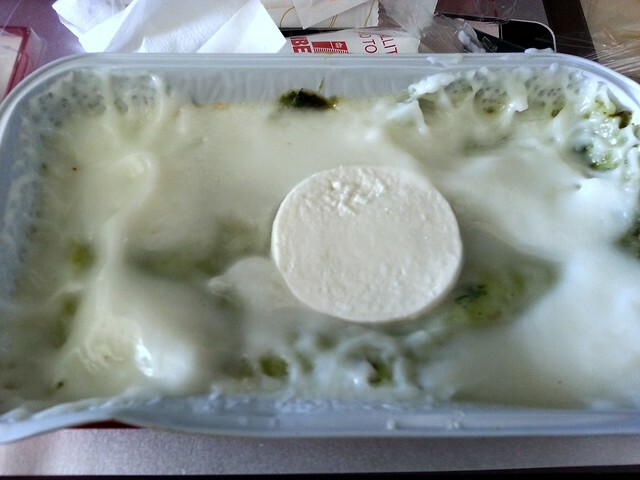 To the best of our recollection, this was the Spanish national airline (on a flight to the capital of Austria) serving, uh, lasagna with a "white sauce." In fairness, it wasn't inedible; it was merely sad. I guess if you're hungry enough, you'll even eat food that looks like this. We'll skip over the fact that Iberia managed to miss not only our outbound connection but our inbound one as well. We won't be flying them again. Ever. Last edited by Gypsy Boy on June 16th, 2014, 5:53 am, edited 1 time in total. On a related topic, what's NOT allowed to be eaten on airplanes. On a recent Southwest flight, we were told not only that peanuts would not be served but that peanuts could not be eaten (those peanut M&M's, hang onto them until we land). This did not seem unreasonable to me, but I'd never heard a prohibition announced. However, my flight was week before last; talked to someone who was on another Southwest flight just last week and they did not think that prohibition had been announced...but they didn't get served peanuts (pretzels, instead.) SWA could be just using up inventory before a system-wide ban on nuts. I can live without them in flight. I am pretty sure I have gotten peanuts on a few Southwest flights. David Hammond wrote: On a related topic, what's NOT allowed to be eaten on airplanes. On a recent Southwest flight, we were told not only that peanuts would not be served but that peanuts could not be eaten (those peanut M&M's, hang onto them until we land). This did not seem unreasonable to me, but I'd never heard a prohibition announced. Flew Southwest over Thanksgiving. On the first flight it was announced overhead as "peanut-free". On the return trip there was no announcement and peanuts were served. What I observed on the outbound trip was that a family pre-boarded, and had obviously given the child's allergies as the reason to pre-board, as the boarding flight attendant confirmed that they had an epi pen with them. My conclusion was that an individual/family can request a peanut-free flight and it is then delivered. David Hammond wrote: On a recent Southwest flight, we were told not only that peanuts would not be served but that peanuts could not be eaten (those peanut M&M's, hang onto them until we land). This did not seem unreasonable to me, but I'd never heard a prohibition announced. I'm at a total loss on how this absurd ban could just be so flippantly announced, let alone that it's not unreasonable. I agree that the sacrifice being requested (you can't eat any peanut products you brought for yourself) is minimal, but the justification for the request (potential allergic reaction to airborne particles) is dubious, and it sounds like they aren't offering any compensation (eg. large selection of unlimited free non-peanut snacks) for your sacrifice. The flight isn't free. To try and accommodate some hyper-sensitivity that isn't controllable in the vast majority of situations, with no compensation to those restrained by the accommodation, seems like the definition of unreasonable. I wouldn't put up a scene, because nothing can be gained on the spot. But I sure as hell would be disgusted with the airline, and avoid them like the plague. *Full Disclosure: I fly out of O'Hare because of location, having taken SWA only once, 19 years ago, never to be repeated. I've flown Southwest numerous times, and the only time I experienced problems was three years ago, when I flew down to New Orleans at Christmas time, and the weather turned lousy, and the pilot circled the runway for 15 minutes before finally giving up and diverting to Houston. After sitting on the runway at Houston for 30 minutes, he then flew back to New Orleans, and was able to land. Love airline food? United Airlines is selling a cookbook. I realize that I am responding to year old posts just above, but peanuts will no longer be served on Southwest flights.